New programs are training laypeople to deal with psychological emergencies—but how much do they actually help those in crisis? A heart attack and a panic attack are both medical crises of a kind. But millions of ordinary people, beyond the medical establishment itself, have been trained to respond to that first kind of physical crisis. We call it first aid: immediate assistance for suddenly ailing or injured people, often with the goal of averting disaster while calling for professional help. Since the 19th century, everyone from wartime ambulance drivers to baby sitters have been trained to handle scenarios including wounds, choking incidents, and heart attacks. It’s not the same as being a doctor, but it’s a big help. In just the last few years, experts have begun arguing that we need a program like this for mental health emergencies, too. Last year, a program called Mental Health First Aid received federal funding for the first time. In Australia, where the program originated, 1 percent of the adult population is said to have attended a course; there and in the United States and Europe, experts are beginning to test how well it works. In the United States, more than 300,000 people have been trained, including more than 2,000 in Massachusetts. The idea is to be able to respond to mental health emergencies calmly and proactively, and to be able to promptly steer those in need toward the right resources. But the programs also inadvertently illuminate the extraordinary complexity of mental illness, and the limitations of a fraying safety net. Mental Health First Aid shows signs of benefiting the communities it serves in certain ways. But as far as other core goals go, it’s not clear whether it helps. That conundrum raises the question of just how far the metaphor of first aid really extends, and of how much even the most innovative individual programs can do to make up for the shortfalls of the system as a whole. In 2015, mental illness is still attended by some stigma and fear, but there are also signs that Americans are beginning to treat mental health more like physical health. The University of Chicago’s General Social Survey has shown that support for treatment and awareness of the neurobiological causes of mental illness rose significantly between 1996 and 2006, for example. High-profile suicides and crimes by the mentally ill have contributed to awareness, if not always empathy; the Affordable Care Act has moved to require insurers to cover mental health treatments as they do other medical care. “As a nation, we’re very interested in mental illness” at the moment, Rosenberg said. “We weren’t so interested 10 or 20 years ago. But mental illness has come out of the closet, the way cancer did 50 years ago.” Today an increasing number of people are not only comfortable talking about mental illness, but want to know how to help. 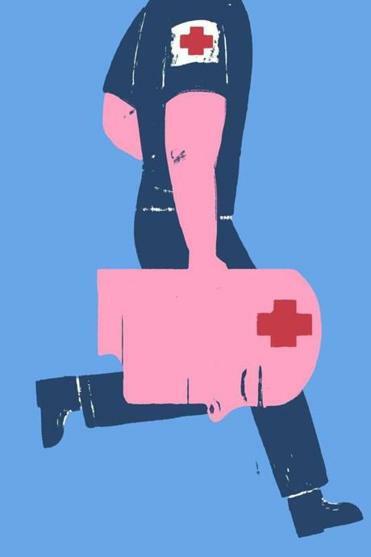 Mental Health First Aid is not the only mental health program to use first aid as a metaphor. There’s QPR, a suicide-prevention course that explicitly compares itself to CPR. (The initials stand for “question, persuade, refer.”) Another approach called “psychological first aid,” designed for use by first responders to major disasters, is intended to minimize incidences of PTSD. 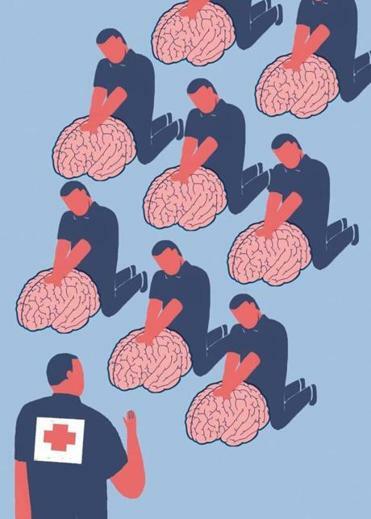 Mental Health First Aid, with its broad focus, has quickly become one of the most prominent gatekeeper programs: It has “perhaps the most momentum,” said Daniel Eisenberg, an associate professor of health management and policy at the University of Michigan School of Public Health. “There’s a lot of enthusiasm in general for the concept.” The program has increased its reach dramatically within the last several years, and is now being used in 23 countries. Within the United States, where it launched in 2008, Rosenberg says more than 300,000 people have taken the course, including Chirlane McCray, the first lady of New York City. Funding is beginning to follow: Congress allotted $15 million last year to train teachers and others who work with students in the program, under the auspices of the Substance Abuse and Mental Health Services Administration. This year’s federal budget includes another $15 million. Eisenberg, who coconducted a randomized control trial of the program’s effectiveness on 32 college campuses for a study published last year, calls his results “glass half-full, glass half-empty.” The resident advisers who were randomly assigned to the program reported higher levels of confidence in their abilities to recognize mental health issues months later, and were more likely to use counseling or therapy themselves. But there was no evidence that the college students under the trainees’ supervision wound up using more mental health services, or that the trainees were more likely to discuss mental health issues with them. Eisenberg and others say that one key improvement would be incorporating occasional tuneups and reviews, to keep the training fresh. Even if the clearer benefit is to the trainees, though, that could still change things for those with mental illness down the line. Wilson says the class goes a long way to de-stigmatizing mental illness, a valuable end in itself. “If [more people] can change their perception of mental illness, and of individuals experiencing mental illness, it gives a person with mental illness an opportunity to be managed differently,” she said. These facts suggest a fundamental question about these gatekeeper programs: Just how useful a metaphor is “first aid” for dealing with mental illness? With traditional first aid, there’s a discrete mechanical problem that theoretically can be resolved in one crucial moment, even if the person in need goes on to require further care. Serious mental health crises are infinitely more complex. • 2013: Is health insurance an antidepressant?